One of the many responsibilities that comes with dog ownership is training this wonderful animal. 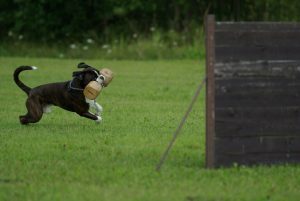 Some breeds take to training easier than others, but the majority of canines can be trained to at least follow the basic commands. At the very least there are a few essential commands that a dog must learn to obey. Partly because these commands keep them safe, and at the same time make owning the dog far more pleasurable. Teaching the basic commands takes a commitment on the part of the dog owner or trainer. It is something that has to be done every day and in the proper manner. For some dogs, it will require patience as it may take them a little longer to catch on. They eventually will and the rewards of doing so will be well worth it for both the dog and the owner. This is probably the first command that most new dog owners will try and teach their dog. It is well worth it because of its importance. It is also one of the easiest commands to teach and for the dog to learn. Having a dog become obedient is so important for the safety of the dog and others that may come in contact with him. By teaching the dog this command it can mean the difference of the dog taking off whenever he pleases. It also avoids possible injury to them running in front of a car. Again the benefits of teaching a dog to stay are similar to teaching them to come. They may be tempted to run after something that has caught their attention. By being able to command them to stay it deters them from doing this and may keep them out of harm’s way. Most dogs are very boisterous and friendly. They love to greet people. Not everyone wants a dog jumping on them especially if its a big one. Although, the little ones can be quite annoying when they do this as well. Teaching them down early gets the message out to them that jumping up is not acceptable. Basically, the dog is learning good manners. When a dog has mastered these commands they are at a point where the owner can be confident when they take the dog out in public. They can also rest easy when they have company in the home. Aside from these, there may be some other training that is needed. Some will depend on specific traits that the dog may be demonstrating. For example, the dog may have to be trained not to bark unnecessarily or perhaps stay off the furniture. No matter what the reason or the type of training that is required following through with it is a must.